Before the concert, the promo video for their new single Fat Bottomed Girls (directed by Dennis De Vallance) is filmed. This is the first show of Queen's tour supporting their new album "Jazz" (although the LP isn't to be released for a couple weeks), and their stage show has once again changed dramatically. Their new lighting rig has rows of lights that are so warm underneath that it has earned the nickname "pizza oven." At the beginning and end of the show, when the lighting rig rises and descends respectively, the intense heat from all the lights is felt by audience members in the first few rows. Five new songs from the Jazz album are heard tonight. 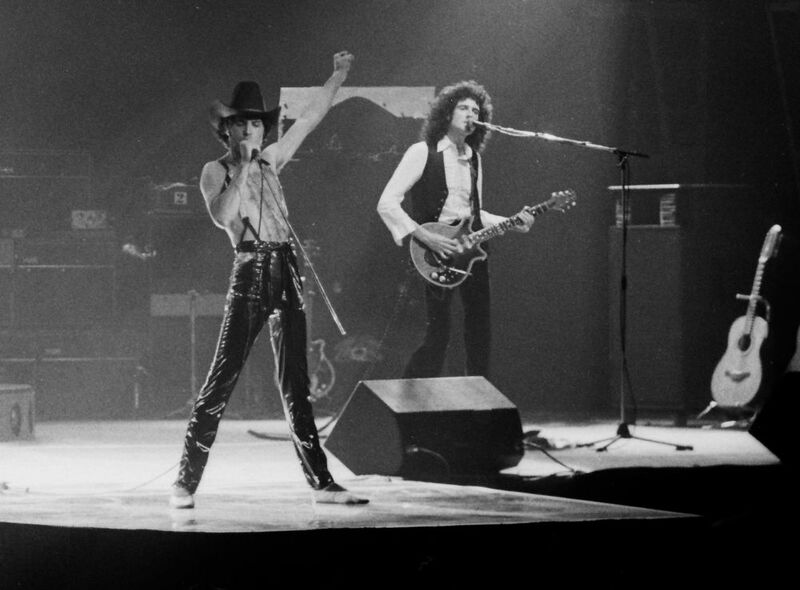 Let Me Entertain You, If You Can't Beat Them and Dreamers Ball are new to the audience, but Fat Bottomed Girls and Bicycle Race were released as a single a couple weeks earlier. 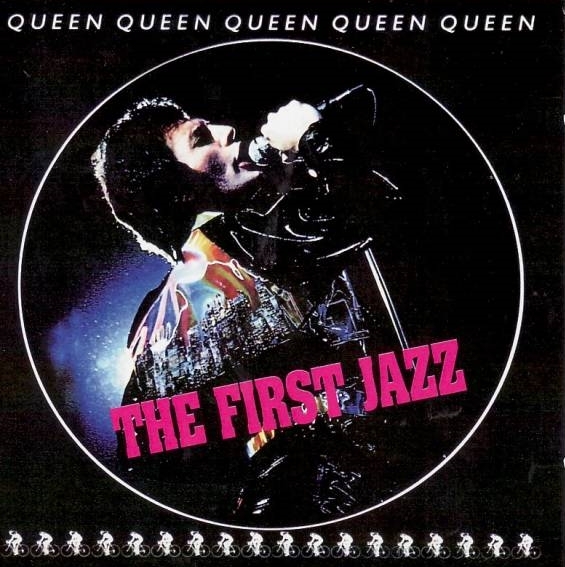 After the house lights go down, the show now opens with thunder being heard (as recorded by Brian May, and heard at the end of "Dead On Time" from the Jazz album), and Brian walking on stage first to play the opening chords of the fast version of We Will Rock You. This Dallas version of Let Me Entertain You is the closest to the record it would sound before it was developed into the blistering #2 live number. 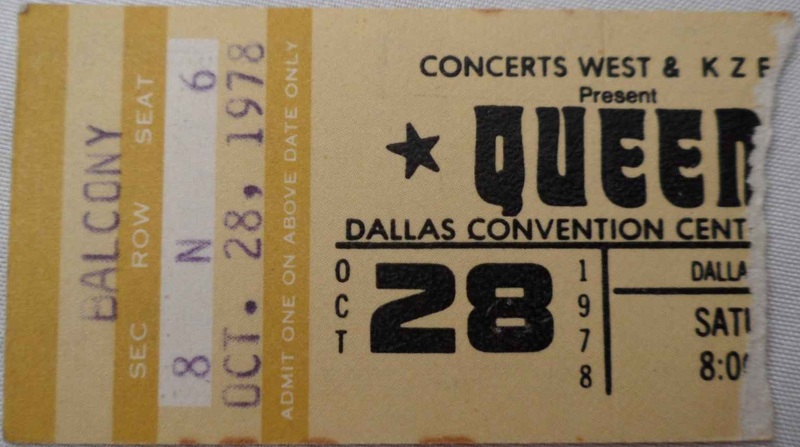 After the song, Freddie tells the audience that this is the first show of the American tour. "We have got a lot of new material for you, and you obviously are the first audience who are gonna listen to it. So anything might happen tonight, just about anything." Many older songs are dropped from the setlist to accomodate the newer material, but no other older songs are introduced or revived. For this first show, Let Me Entertain You and If You Can't Beat Them are performed successively, but soon Somebody To Love would be placed between them, as the band felt they should separate the new songs. 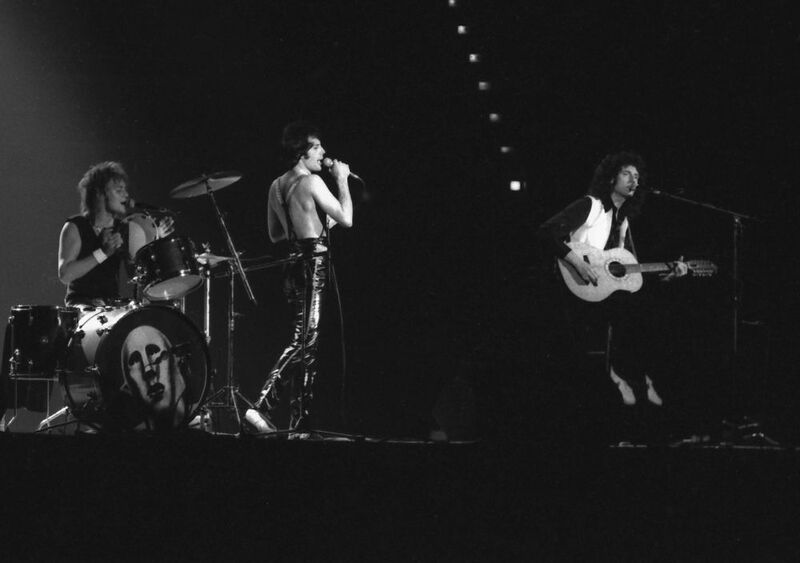 Brian introduces Death On Two Legs after If You Can't Beat Them, but Freddie jumps in as there is a discrepancy with the setlist (perhaps even with the sound man as well, as Freddie's piano mic needs to be turned up a great deal after he starts speaking). "We're not gonna do that just yet. I'll kill you when I get in the dressing room!" he jokes to Brian. He continues, "We're gonna do a song... we're gonna do Death On Two Legs, don't worry, but before we do that, I'd like to do a song I like." This amuses the audience. "This is called Somebody To Love." The band sound a little rusty tonight at times, being the first show of the tour. They have some trouble getting into I'm In Love With My Car, and it takes an extra couple bars before they're back together again. 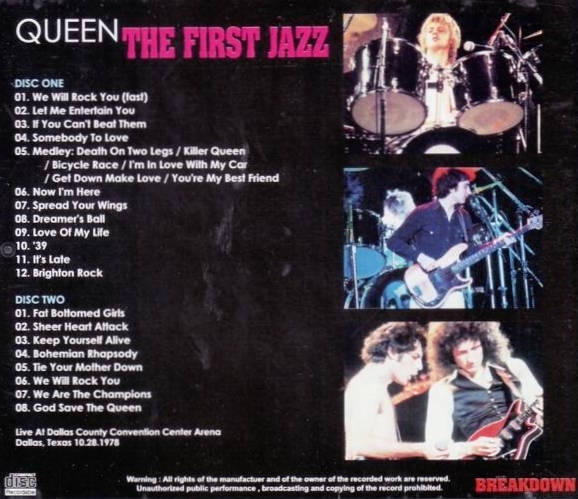 Two songs are cut from the medley for this tour, and they add a portion of Bicycle Race to it. To queue the band out of the middle section of Get Down Make Love, Roger Taylor now blows a whistle from behind the drum kit. 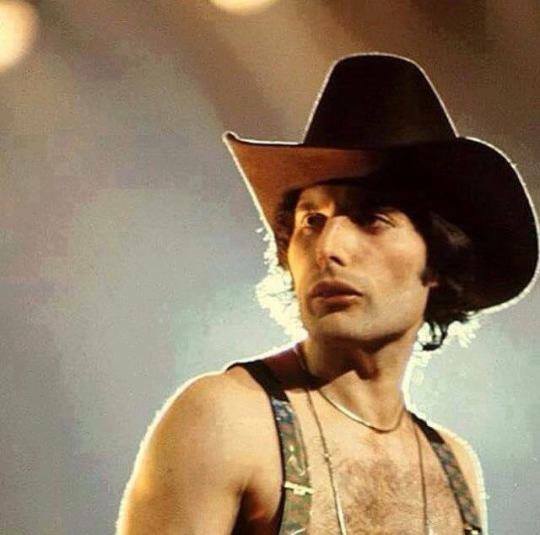 Freddie, after Now I'm Here: "A lot of people call this next song Spread Your Legs. It started off being called Spread Your Wings, but you can call it what you'd like." For the acoustic set on this tour, an additional smaller stage is lowered for the band to play on. A scaled-down 5-piece drum kit is there for Roger to play on Dreamers Ball and '39. On this drum kit the News Of The World robot remains the bass drum head, but his main kit now sports the Jazz album logo. But for some reason, within a few shows he would revert back to the robot for the rest of the North American leg and ultimately switch back to the Jazz logo in Europe 1979. During the instrumental section of Dreamers Ball, Brian and Roger play some vocal brass. 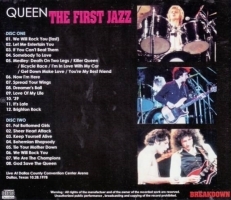 During Brian's "trombone" solo, Freddie, clearly excited by this new addition to their show, says, "Listen to that!" Roger isn't doing his 'muted trumpet' part yet this early in the tour (although he would be by New York). On each side of the stage, there is a runway stretching out a few rows into the audience. 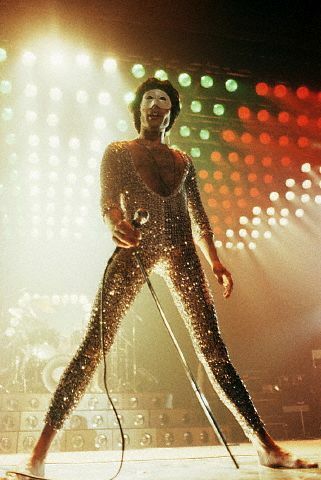 It would be used for key points in the show, like the first verse of It's Late, which features only Freddie and Brian, each on his own runway. The smaller stage is raised back up to its original position at this point, adding to the drama and building to the next peak of the show. The opening night of the tour is only an hour and forty-five minutes long, but Now I'm Here and the Brighton Rock jam would get longer over time, bringing the show closer to two hours, and sometimes beyond. Tonight's compact version of Brighton Rock reveals the Brian/Roger/John jam in its infancy. This is the first concert where Roger would play the tympani. He plays it the same general spot of the show as he would for the next couple years, but it isn't a feature spot for him just yet this early in the tour. Roger plays the drum intro to Sheer Heart Attack in the wrong spot (did they not have a setlist written for the drummer?!). Freddie urges him to "cool it" and then introduces the debut concert performance of Fat Bottomed Girls. "You're a good audience, and you can take all the new numbers," he insists. "Would you like a new song?" They definitely would, judging by their positive response. The bulk of the song goes well, although the band barely manage to finish the song together. From here onward, before the last cycle of the improvised section, Freddie would solve the problem by singing "one more time." The flow of Sheer Heart Attack into Keep Yourself Alive is quite unique. Bohemian Rhapsody is the last song of the set proper. Freddie sings it beautifully, and it leaves the audience screaming for more. Tie Your Mother Down is used as an encore number for the first time (they used it as an encore a few more times in the early 80s). They finish the show with We Will Rock You and We Are The Champions. 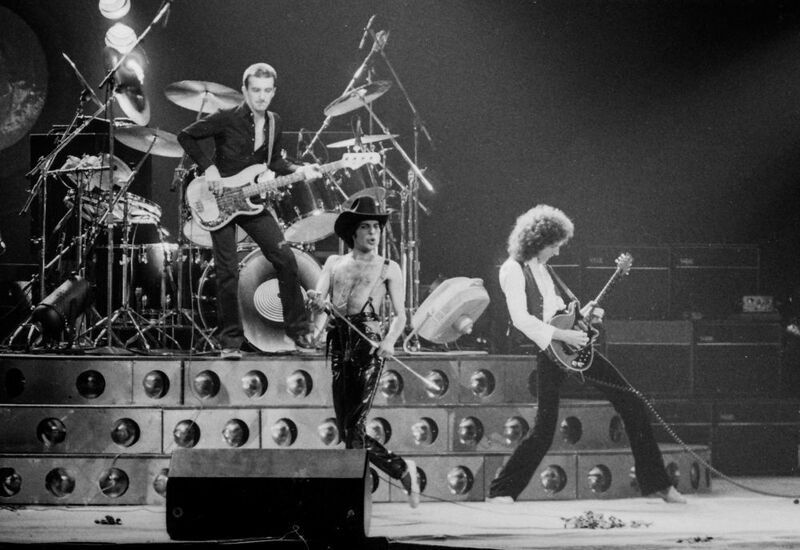 The pair of rock anthems would finish most of Queen's concerts through 1986, as well as their later collaborations into the 21st century. The first pic is by Peter Hince, head of the Queen crew. 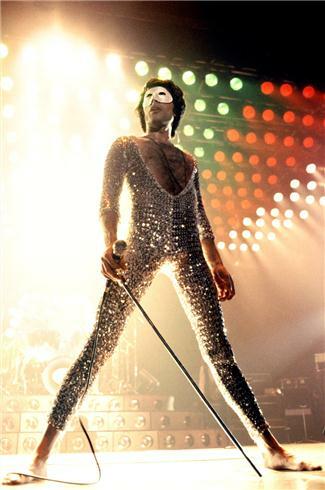 The pictures of Freddie in his silver lurex suit were taken by John Rodgers. The black and white photos were taken by (and copyrighted to) Curtis Smith. 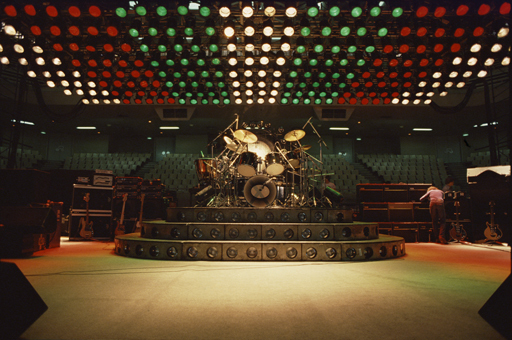 For many years it was thought the recording existed only through Keep Yourself Alive. The taper shared the complete recording online in 2006 after realizing it hadn't circulated in full. His master copy didn't completely survive over the years, but fortunately a copy was made back in the day. The second disc is from the master, so it sounds a tad better. Before Spread Your Wings, the taper and his friend can be heard talking. "Did you rewind it as much as you can?" Breakdown bootlegged presumably the above version.